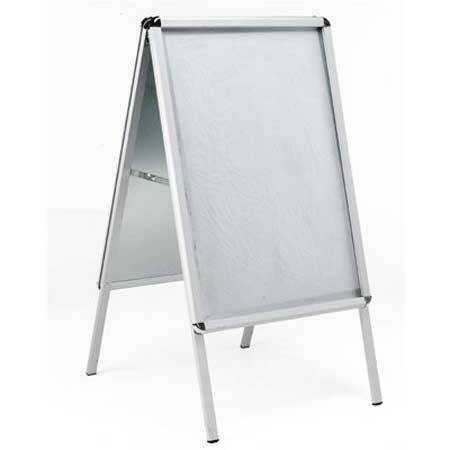 Our Aluminium Snap Frame A-board is a double-sided A-board that offers a convenient way to display prints and posters. This Snap Frame A-board has a snap-action frame that enables quick and easy poster change, simply snap open, load your poster and snap shut. The Snap Frame A-board also incorporates an PVC cover that protects your posters and also reflects glare. The Snap Frame A-board is made from 32mm wide anodised aluminium profiles and steel back panels which add weight for stability. Optional leaflet holders are available separately, that simply hook onto the a-board arms. These Snap Frame A-boards are easy to fold up and carry  perfect for quick advertising.